Today marks the 49th anniversary of when the 84th Entry of Aircraft Apprentices at RAF Locking finally completed their training and headed off into the "man's" Air Force - or at least that is how I viewed it all those years ago! I feel therefore that today is an excellent day on which to bring you the definitive news of the inaugural Reunion of our Entry to be held exactly one year from today to mark the 50 years since we "Passed Out" from Locking. Your self-appointed organisers have spent some considerable effort these past weeks in reviewing, researching and finally deciding on a suitable venue. We have now reached a conclusion and are pleased to say that we believe we have chosen a venue that will suitably meet the standards we would all wish to enjoy on such an auspicious occasion. The Hotel chosen is located in a beautiful part of the country and easily accessed from all corners of the globe and close to the motorway network and national/regional airports. We have looked closely at all the major hotel "chains" and, apart from being generally disappointed with a number of them for various reasons, we have come away with the feeling that large chains do not have the close personal touch of the independent hotels nor do they demonstrate the experience we look for in catering for functions such as we intend to hold. Our chosen Hotel is well-versed in catering for business functions, they have experienced staff and as it is privately owned and run, the management team have a vested interest in ensuring that guests' demands and needs are fully met. The Hotel is also the home of the Pudding Club famous for its range and quality of menu and which you may have seen on TV. The Hotel we have selected is the Three Ways House Hotel in the village of Mickleton halfway between Chipping Campden and Stratford-upon-Avon. The website is: www.puddingclub.com . To reflect the high quality of its surroundings, furnishing and service, this hotel is not the cheapest available in some national chains, but we have managed to negotiate a special rate for our reunion. £170 per night per double room for dinner, bed and breakfast may initially sound expensive, but close examination of the Macdonald's and Mercure chains for example will quickly reveal their prices to be in the same general range. Spend some time looking at the web site to try and get a feel for the quality of this hotel - it really is quite superb. We have sampled the food and again can confirm it to be of excellent standard. We have a copy of a recent dinner menu which we will scan and e-mail to everyone shortly to give you all an idea of what the Hotel can achieve. On a recent visit to finalise our choice, we were shown 7 or 8 of the rooms and each one was individual, very well furnished, comfortable and all in quite excellent order. Some of the rooms can be seen on the website. As organisers of the Reunion, we do not want any aspect of the accommodation and catering to detract from the main event. Should anyone wish to have further information, or receive a copy of the hotel brochure, please telephone me on 01767 220055 and I will do all I can to clarify any issue you may have. Finally, the dates selected for our Reunion are from Sunday afternoon, 26th July 2009, arriving in time for Dinner, to after breakfast on Tuesday 28th July 2009 with the main anniversary meal being Dinner on Monday, 27th. This will give us all the opportunity to rekindle the past with the present and enjoy catching up with each other rather than a more hectic one-night event. We will also be able to relax and unwind in excellent company in the comfortable ambience of the Hotel and among the fine landscape of the Cotswolds. Booking information will be forwarded very shortly, but suffice to say that our rooms for the 2 nights are already booked (and a deposit left) so impressed were we with the all the facilities we will enjoy next year. In my e-mail of 28th July, I promised to send further information relating to the booking of the Hotel for our Reunion next year. Hopefully, you will all now have had time to look at the Hotel's website, www.puddingclub.com and you may also have noted their telephone number, which is 01386-438429. You can also e-mail your reservation at reception@puddingclub.com. In all cases, please quote "84th Entry 50th Anniversary Reunion" when making your reservations. 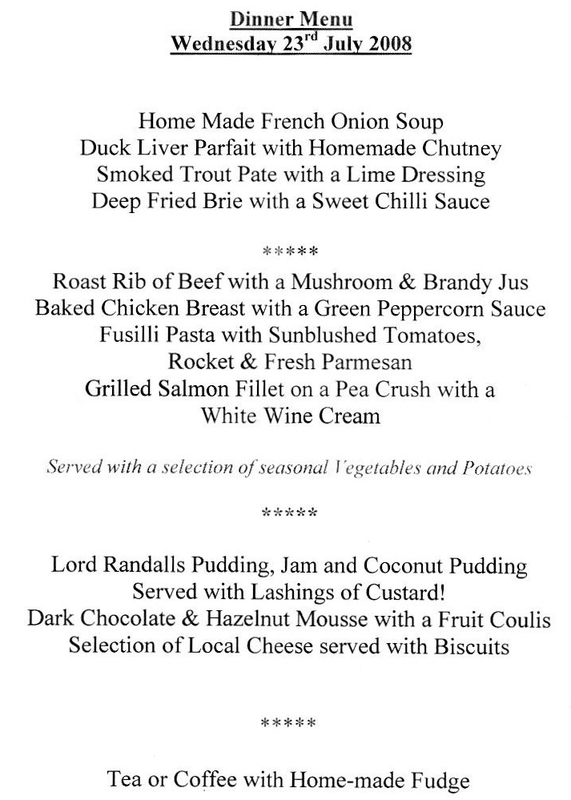 I have also attached to this e-mail a specimen menu - this is typical of the dinner we can look forward to; however, the Hotel can also cater for most types of special dietary requirement including gluten free. Please discuss any specific needs you may have when making your bookings. Finally, should anyone have any further queries, please e-mail or telephone me on 01767-220055 and I will do my best to help.